Habit: Annual, glabrous or generally sparsely stellate-hairy; plant with bisexual or only pistillate flowers. 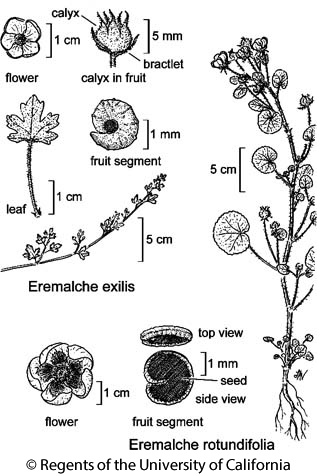 Stem: prostrate to erect, +- hollow. Leaf: blade toothed to lobed or dissected, bases symmetric. Inflorescence: flowers 1 in leaf axils or in axillary or terminal clusters; flowering stalks longer in fruit; bractlets subtending calyx 3, persistent, linear to thread-like. Flower: calyx lobes > tube, acuminate; petals generally > calyx, white to +- purple (drying darker); filament tube included, anthers at tip; styles > filament tube, stigmas head-like. Fruit: segments generally 9--22 or 25--35, unarmed, glabrous, generally +- black, sides fragile, outer edges, back ridged or net-veined. Stem: prostrate to decumbent, < 50 cm, finely stellate-hairy. Leaf: generally 1--2.5 cm wide, 3--5-lobed; lobe tips entire or 3-toothed. Inflorescence: flowers 1 in leaf axils, scattered on stem, occasionally near stem base, +- = subtending leaves; bractlets 3--7 mm. Flower: bisexual; calyx 4--7 mm, lobes 3--5 mm, 1.5--2.5 mm wide; petals 4--5.5 mm, white or pale pink-purple. Fruit: segments 9--13, 1.4--1.8 mm, +- wedge-shaped in ×-section, margins rounded, outer wall cross-ridged. Chromosomes: 2n=20,40. Citation for this treatment: Katarina Andreasen & David M. Bates 2012, Eremalche exilis, in Jepson Flora Project (eds.) Jepson eFlora, http://ucjeps.berkeley.edu/eflora/eflora_display.php?tid=24546, accessed on April 23, 2019. SnJV, SCoRI, ChI (probably extirpated), SnGb, W&I, D; Markers link to CCH specimen records. Yellow markers indicate records that may provide evidence for eFlora range revision or may have georeferencing or identification issues. Purple markers indicate specimens collected from a garden, greenhouse, or other non-wild location.